Anyone who has read my blog knows that I'm slightly obsessed with raspberries. They're my favorite fruit -- the one thing that I could never get enough of. So when the weather turned cool and the raspberries came into season in Ohio again, I bought 10 pints and made jam. These are the cool canning implements that my mother bought me long ago when the kids were little and I lived in Michigan with a canning kitchen in the basement. First things first, I boiled my clean canning jars. Don't they look sparkly enough to put jam in? I loved measuring the five cups of raspberries and pouring them into the bowl. 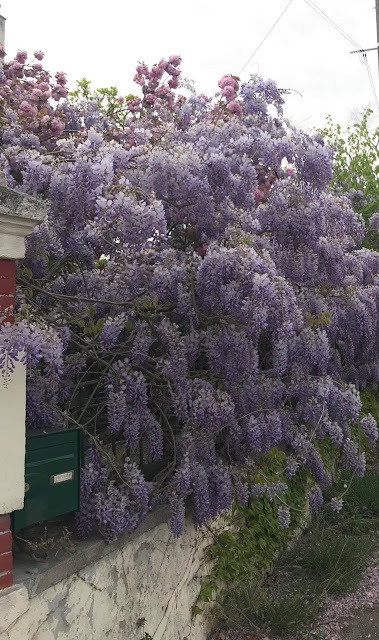 It looked like such a bounty of berries. We mashed the berries (Grace helped) with the old potato masher. They are much easier to squish than strawberries. The raspberries were practically begging to be pulverized. Grace measured out the 7 cups of sugar into a separate bowl while I started cooking the mashed raspberries with the fruit pectin and stired until it reached a rolling boil. Grace poured the sugar into the pan and I stirred like crazy trying to get it all mixed in. While I was waiting for this new mixture to boil, I directed Tucker to roll out the dough for the French bread. He kneaded it, separated it into two loaves, and set it out to rise. When the jam was boiling again, I set the timer for two minutes. The recipe only calls for one minute but my mom's jam is notorious for not jelling, so I cooked it two minutes per her instructions. When it was finished, I ladled it into the clean jars, and then my favorite part, I used the little magnet implement to pick up the boiling lid jars and rings. Once they were in place, I inverted the jars for five minutes before turning them up and voila. Now, I've done stories on canning before and I know that the USDA calls for boiling the canning jars with the jam inside and that is what I've always done. But the recipe for this jam said it could be done either way, so I saved myself that step. I'm imagining my pharmacy/food expert friend Linda saying the sugar content is so high that it shouldn't be a problem. A lot of times I put the finished jam in the freezer anyway so it keeps its lovely red color. Today, Grace asked for a French bread and raspberry jam sandwich in her lunch. She thought it was good, and it may last us a few months before I have to buy more at Trader Joe's. I love to read. There was a day when I forced myself to finish every book I picked up, even if it was bad. I wanted to give it a chance to redeem itself. Now that I'm working so many hours, I require more from my leisure activity. Reading is an escape for me, so I rarely pick up a horror book or thriller. I want something that will end well even if it drags me through emotional furrows on the way there. I have two books that I began recently and will not finish. The first one got good reviews and that's why I started it. 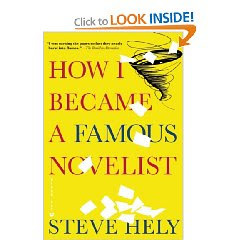 How I Became A Famous Novelist by Steve Hely promised a romp through the pages. "I was turning the pages so fast they nearly burst into flames," The Brooklyn Alternative raved on the book's front cover. I suspect the pages nearly burst into flames for other reasons. To me, it seemed totally predictable. Here's Pete, an ivy league guy who has a fringe job and hasn't made the most of his potential. He lives with a roommate and doesn't keep up on his hygiene. He scoffs at his former classmates who are actually successful and making money. Of course, he will find a way to make a ton of money too by playing the system. Yawn. I put it down while he was sitting on the couch next to his roommate watching their favorite TV journalist interview an author. I think the next page or the next chapter will lead to his "Eureka" moment -- a way to write a best-selling novel that will bring him back the girlfriend he lost in college. I can't spoil it for you though, because I didn't make it that far. 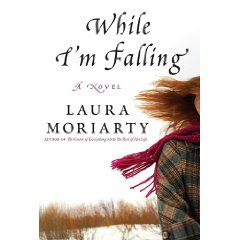 The other book I won't finish is While I'm Falling by Laura Moriarty. Veronica is a junior in college when she finds out her parents are divorcing because her mother cheated. Veronica has declared herself premed, even though she's really bad at it. This puzzled me. Here's college with a thousand choices and she's stressed out because she can't focus on the parts of a dog shark for a dissection. What she's really looking forward to is housesitting for an acquaintance and driving his car. She drops him at the airport, and an ice storm starts immediately, before she pulls from the airport parking lot. Surprise! She wrecks the car on the highway. When she realizes no police officers will be coming for awhile because of all the accidents, Veronica gets out and begins walking. An 18-wheeler stops for her, and, against her better judgment, she gets in. The driver misses her exit. And the exit after! Duh, duh, duh, duh. (That's the sinister music.) I look at the book and see how much of it is left. A lot. Is she going to be captured by the crazed truck driver for the rest of the book, I wonder. No, for some strange reason, he wasn't a really bad kidnapper. He stops at the next turnpike plaza and lets her out. She forgot her cell phone and has no money. When she finally gets back to her dorm, a friend drives her to the house where she is housesitting so she can water the plants. They decide to start drinking. Another stellar decision on her part. "I cannot fairly blame the decisions I made for the rest of that evening on alcohol," Veronica says (111). Apparently, she invited a lot of friends and non-friends over to trash the place. That's when I put the book down. I can't stand watching characters make such ridiculous choices. Now I'm afraid to pick up another book. Any suggestions? If I had a twitter account, I would send a tweet right now that suggests my 17-year-old daughter is actually a 70-year-old woman in disguise. She just turned the TV to the Golden Girls and is laughing at it. I didn't like that show even when it was new, and I'm much closer to their age now. Still not funny. Well, we made it to day three before there was yelling in the morning on the way out the door to school. I'm not sure if that's a record because I haven't kept track. But, suffice it to say that pressure was building already. It started yesterday afternoon when said child realized he had forgotten books he needed to do homework so we drove back to the school to visit his locker. Then I dropped him to play basketball for an hour and a half, he came home to finish his homework and went out on an hour-long Mike & Ike run with his buddies. Going to bed about 10:30, after complaining that his friends stay up to 1 a.m. no problem and still get all "A"s, he suddenly began complaining about a headache. Was that dehydration from playing basketball in 87-degree heat or from the gross chemicals in the Mike & Ike's? Then this morning as we are leaving he pulls papers from his backpack, "You need to sign these." Could I have signed them while he was watching Family Guy the night before? "You have to keep up with everything," I yelled. Yes, I was the yeller and he was the yellee. But, this just goes to prove my point that the best thing ever about homeschooling was the fact that you didn't have to get your kids out the door every morning. Because getting the kids out the door causes stress which leads to yelling and sometimes crying, but we haven't gotten there yet. When the kids were little, maybe 5, 3 and 1, Grace and Spencer went to a Montessori school. Each morning, I would bribe one-year-old Tucker with a Mento if he would get in his car seat and get buckled. Like Pavlov's dog, he learned his lesson well and still craves sugar as a reward. Fast forward to ages 17, 15, and 13, getting out of the house is still hard. "Why do we have to leave so early?" "Did you get the box of tissues I have to turn in for extra credit?" "Did you pay my school fees?" I'm so grateful for those nine years of homeschooling when I wasn't yelling at my kids, at least not to get them out the door. Now, I have only a few years to catch up on all that yelling I missed. Last year when the kids went back to school, it was the first time all three of my children actually attended. My husband was still working a normal schedule so he left for work in the morning, and I wondered what mothers do when their kids are gone if they aren't working. I didn't have any classes that day, so I spent the hours cleaning the house. It seemed like a renewal kind of thing. Yesterday, the kids headed back to school again. I'd spent hundreds of dollars on school supplies and clothes, and I got up at 5 to get to the grocery store to buy the requisite boxes of tissues for the teachers. I had to teach a few hours and I took along my gym bag, planning to work out, but when I walked out of the building a little before noon, the sky was so blue and the air was crisp. I called my husband, who is now on the crazy schedule with days off on Monday and Tuesday (?) and said, "Let's go for a bike ride." The bike trail is about a mile from our house and it winds along the Olentangy River. It has some definite flaws especially as it goes through Ohio State. It's under construction and the path goes up a hill right by the old student union where people are trying to walk. But the air felt fresh, like the harbinger of fall. I loved the sound of the few crisp leave crunching under the tires, mixed with the steady chirp of the crickets. The buzz of cicadas in the trees seemed to herald the end of summer. Along the river I saw an egret glide in for a landing, its white wings cocked above the greenish brown of the water. A great blue heron stood placidly in the water at another spot, ignoring the squawking of the geese. My bike is smaller than my husband's and my legs are much shorter, so it seems like I pedal constantly but can't keep up with him. That was okay because I loved the whoosh of the wind in my ears. We got home in time to take a nap before picking up the kids from school. And, although we had to ferry them to a nuber of places, like to the doctor to remove stitches, they were all enthusiastic about their first day, and about the milkshakes my husband had ready when they came in the door from that first day of school. Any letter from an agent that starts out: "You are clearly a talented writer," must be good news, right? I mean, there's some affirmation that my hours slogging away over a keyboard in a coffee shop must be paying off. And if that letter continued with "there is much to be admired in these pages," surely an offer must follow, right? Instead, the dreaded phrase: "That said..." came next. Which meant, better luck next time. She didn't "fall in love" with it. I'd take some infatuation at this point. I'm used to rejection. I've written two novels. I've had a number, maybe a third, of the agents I queried ask to see all or part of a novel, but each time it falls a little short. I'm not sure that the nice words help. Maybe someone should say, "This is crap. Stop wasting your time." Then I could take up needlepoint or dog training. Instead I get letters, like the one early on that promised me, "We're sure you'll sell this." Why not that agent then if she was so sure? I don't want to become bitter. I'll swallow and send out more queries on my second novel until my third novel is done. Then I'll be back to editing and trying to sell it. What I'm really trying to sell though is myself. And although I've gotten a hard enough shell to not fret over every rejection, this one hurt a little. I felt tears sting my eyes. I felt like I'd gotten so close. Just last week, I got a form rejection letter that I thought was so cute I even laughed at it. This agent didn't request to see my work, not even the first five pages, but I admired how much money he must be saving on paper with the teeny, tiny rejection form. Maybe the next agent will feel some chemistry, just a spark that we can fan to catch fire. Meanwhile, I guess I need to take it easy and enjoy the process. To quote another memorable writer, Miley Cyrus: "It ain't about how fast I get there, it ain't about what's waitin' on the other side. It's the climb." My youngest son loves 2 percent milk, but we rarely buy it. Most of the time, I figure my kids are American and they're getting plenty of fat, so we buy skim milk. Today I was at the grocery, reaching in for the gallon of skim, organic milk when I noticed a discount sticker on the organic milk next to it. The milk usually costs about $5.69 and this was marked down to $2.49. But, it was whole milk. Tucker has asked me to buy whole milk. He has begged me to buy whole milk. He figured as tasty as 2 percent is, whole milk must be twice as good. So I came home with that high-fat gallon. When he returned from a friend's house, I announced my purchase. He ran to the refrigerator and screwed off the red cap. He poured the thick liquid into a glass and took a sip. "Ohhh. That is disgusting!" he said. "That is so thick I can taste the cow." This morning after my run, the sky was still dark and I lay down in the hammock. I used one leg to swing myself as the sky brightened and I could make out small dark clouds that skittered across the gray. Sometimes when I run early in the morning, I'll look up and see the moon. It always makes me smile. I'll say, "You're still there?" like the moon is an old friend I haven't seen in awhile, but there whenever I look for it. On Tuesday the moon was just a crescent and Venus was twinkling brightly above it. I lay in the hammock thinking that I should spend more time outdoors. The outdoors is rejuvenating really, especially now that it's hot enough for the air conditioning. And soon the summer will be gone and I'll wish I'd spent more time basking in the sun or feeling the cool breeze on my cheeks or even running through a downpour. Instead, I'll be in my house ensconced in a Snuggie. Even as I thought that, yes, my goal for the next few weeks will be to get out and enjoy the weather, a mosquito landed on my upper arm. I turned toward it and blew, forcing it to move on. It landed again on my forearm. Then the sweat from my recent run trickled down my face, into my ears and started to interfere with my iPod headphones, so I got up and came in the house, to the air conditioning. For awhile now, people have been sending me invitations to Facebook and Linked In, social media kinds of things. I'm resisiting. Obiously, it took me years to actually start writing a blog more frequently than once a month and sometimes I still fall into my old ways, spending my time with actual people rather than my blog friends. I'm not on Facebook because my kids are. It's a place where they can hang out with their friends and not worry that I'm looking over their shoulders. Of course, I have their passwords, so if I ever wanted to look at their pages, I could. I thought I would leave Facebook to them. Maybe that's a moot point since my mother is one of their friends. What are they going to put on Facebook for their grandmother to see? My other thought was, "Am I going to start spending a lot of time updating my Facebook page?" Will this take the place of blogging or am I just going to spend more time on the computer? The other thing about that youtube video is that it was directed toward advertisers, letting them know that advertising will be people driven. Does that mean that if I'm not on Facebook then I won't be getting as much advertising? I mean, look how highly susceptible I am, thinking about joining Facebook because of this video. Don't you think it would be better for me to avoid advertising altogether? So, I'm still torn. Other than the fact that "everybody's doing it," is there another reason I should join Facebook? What am I really missing? 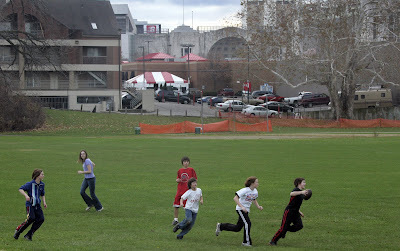 This is a picture that a newspaper photographer took of my children and their friends playing football in a field with the OSU football stadium in the background. 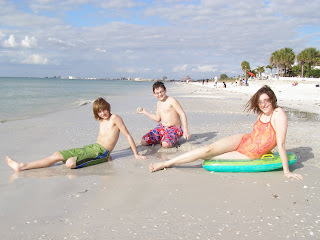 The picture was taken in 2006 which was a much simpler time for us, because we were still homeschooling. We spent our afternoons at rec centers like this one, hanging out with friends and we spent the rest of the day at libraries or museums or parks learning things we were interested in. Lest I forget, there were mornings spent at the dining room table with the kids complaining about their math work too. We homeschooled for nine years and my three children began school two years ago. The first year Grace went to school, as a sophomore, she had to take the Ohio Graduation Test. She passed everything. Right then and there, I declared homeschooling a success. She had learned all she needed at home to pass the graduation test. Success. Now, two years in, I find myself chafing at this straightjacket called school. What set me off was the letter from the principal that said the 8th grade trip to Washington, DC was going to be rescheduled for after the school year ended so it didn't interfere with classroom time, among other reasons. As if the only time students could possibly learn anything is when their butts are attached to a wooden chair. Then NPR had a guest on who was talking about what makes people successful. That set me off too. Kids (and adults) should try something new and be willing to fail, he said. Our kids are not allowed to fail anything in school. The guest said that kids should be encouraged to think creatively. How will they become problem solvers when they are told there's a right way and a wrong way to do things? Ooooh. I hate that kids are being spoonfed information rather than jumping into learning. Homeschooling is the reason that Grace became interested in opera. No, maybe she would have become interested anyway, but it's the reason she had time to explore it. She heard a children's version of Mozart's Magic Flute. She told me she'd like to hear the original. It led to other operas, plus opera camp, and an interest in German, Italian and French. 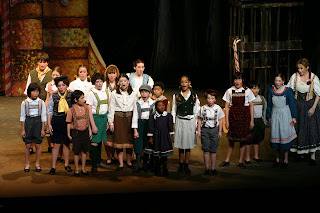 Finally, she got to appear in the children's chorus of Hansel and Gretel when OperaColumbus performed it. She still listens to "weird" music -- opera, and celtic music, and the tech band Ozone from Moldova. Homeschooling is the reason that Spencer became a chess whiz. At Borders one day, he saw a beginning chess set and book. I bought it for him and together we studied the different ways to move the pieces. Just a few months later, we were at a friend's house and I said, "Let's go, Spence." "Just a minute, Mom," he said. "Three more moves and I'll have him in checkmate." I had no idea that people planned ahead in chess. I had no idea that my six-year-old could see the strategy like that. It led to chess clubs and trips to Nashville and Pittsburgh for national chess tournaments. Tucker's love of dinosaurs. His interest in how things are made and historical facts. They all come from giving kids time to learn what they are interested in. This summer, Tucker has spent his days on youtube, searching for instructional videos that show how to play specific songs on the guitar. That will end when he returns to school and he is told now he must learn about American history and algebra. For two years now, my kids have been treading water. They've been told they aren't good at subjects they previously felt passionate about, and they believed the teachers. They've had some good teachers -- an enthusiastic biology 2 teacher, and very involved French teacher, but overall, my kids have stagnated in school. Our frequent vacations have ended. No more two-week respites at my parents' house in Florida with afternoons on the sand as we figure out the physics of waves and building sand bridges or digging holes in the sand. Instead, we juggle the school schedule with the basketball practice and swim practice and the quarter schedule of the college where I teach. Next week, my kids return to school. I haven't tried to convince them to stay home. As a matter of fact, I told Grace she had to go for her senior year to make sure she's competent at meeting deadlines. I know Spencer wouldn't consider staying home because he is focused on basketball season. I'm not sure I would want Tucker to stay home since his current favorite activity is debating me on any subject that I might have an opinion, including bedtime, showers and television. So, my kids will go back to school, but I'll be at the Washington DC trip meeting to voice my opinion. And if my kids have another teacher whose intention is to show them how dumb they are, I'll step up again, and maybe that teacher won't be coming back to school. What if you had one day left to live? How would you spend it? Might you put the bikes on the back of the car and drive to a smooth bike path with some of the people you love? That's what we did yesterday. We whizzed along the 11 miles, under shady trees and then beside tall corn fields. We watched the butterflies zig then zag to miss our zooming bikes and we saw the birds' shadows on the path as they soared overhead. We pretended we were the Pelloton and counted how long it would take to catch the breakaway leader. And at the end of the path, we pushed hard up a hill to get to the small town of Granville where an ice cream shop awaited. A glass of water with a lemon was the first relief, followed by a Coke float with the vanilla ice cream melting into the soda. Then we turned around and glided down that same hill. We stopped at a wooden playground and pumped our legs on the swings until I knew my shoes would touch the clouds. I pushed Grace on a tire swing, her 5-foot, 9-inch body draped over the black rubber swing. Then we got on our bikes and continued the 11 miles back to the car. We sang songs from Disney movies and it was a real treat to hear Supercalifragilisticexpealidocious in French. The girls were moving at a snail's pace. I passed them for awhile and rode ahead. Earl had long since abandoned our slow ride and sped ahead of us. The girls put on a burst of speed and caught up with me, panting and telling me that I was 2 minutes and 40 seconds ahead of the Pelloton before they caught me. We stopped for water and then they boxed me in, refusing to let me go ahead. So we sang songs from The Sound of Music and Beauty and the Beast. The day was hot, high 80s, but as long as we were moving on our bikes we had a nice breeze. Earl turned around to look for us when we were about three miles from the end. The girls decided this was their chance to beat him to the finish line. They tried boxing him in, but got passed when they had to move to the right for an oncoming biker. In the end, they reached the parking lot first, and, amid much groaning and rubbing of butts, we drove home. I picked up Tucker from his band practice for a taste test at the local research center. After I pocketed the $15, and he took the $10, I drove home again. My contacts were foggy and everything seemed blurry. I took out my contacts and realized I was having a hard time focusing. It felt like I'd just looked into a camera flash. I tried to read my email but kept feeling like something was blocking my vision. I cut up some fresh tomatoes for a tomato and vinaigrette salad. Still, things danced in front of my eyes. Finally, I went to lie down. Earl has had a similar experience twice. The doctors figured it was either a small piece of plaque that broke off and headed for his brain but instead went to his eye, or, their second opinion, was a visual migraine. So, I lay in bed, wondering if I was going to die. But, I didn't feel any pain. You can't really go to the emergency room when you aren't in any pain. After awhile, I got up and my vision was better. I sat down in the living room where the girls had turned on the movie 17 Again. I watched and said, "Is that Zack Effron?" But the words felt funny coming from my mouth. Slurred almost. My brain felt fuzzy too. I looked at Matthew Perry and asked, "Is that the guy from friends?" But I really couldn't place him. Next, I felt a tingling in the fingers of my left hand. I kept moving my hand and trying to analyze with my fuzzy brain why my fingers would be feeling numb like they were falling asleep. Finally, I sat by Grace. She leaned her head on me, and I thought if this is my last day, I just need to make sure my family knows I love them. So I kissed each of them. I told them to make good choices (well, I didn't tell Earl that). "Is something wrong, Mom?" Spencer asked. And I just gave him an extra squeeze around his rock-hard middle. UPDATE: I went to the doctor this morning and she felt confident that what I had was a migraine with aura. The aura is the spots that blocked out my peripheral, and much of my straight ahead vision. She has these herself, although the aura usually precludes the onset of the migraine itself. She told me to get back to my vitamins and watch out for triggers. Thank God, I'm not going to die yet. I told a friend that the doctor said it was a migraine with aura. She said, "Is that like a brain tumor with a free gift?" It's a different kind of benefit. Sometimes I find myself being so judgmental when it comes to husbands. I think that I would never put up with -- fill in the blank. I have one friend whose husband insists on being in charge. She has to cajole him, get him in a good mood before she can ask permission to go to a girls' night out. Permission? What, is he your father? This would drive me crazy, but she says she has learned that every kind of marriage has its own idiosyncracies. That's what I need to remember. There's a woman whose blog I read, she has little kids, and her husband apparently spends big chunks of each day playing an online game. I'd be standing in front of him screaming for help, which I'm sure would be good for the marriage. Another friend who has plans to someday leave her husband said she originally set the bar at cheating. She decided if he cheated she would leave. But, she's pretty certain he has cheated several times and she's still there. When does that bar slip? When do we decide just to look the other way for now? Another friend has been going through a rough patch with her husband. He thinks he can trust her again if she hands over all of her emails for the past six months. She has printed them off. She looks at them and wonders how he will interpret each one, what he will find to blame on her. I warn her that this won't be the end. In three months, in six months, he may ask for them again. He may take this stack of emails and accuse her of holding out on him. I don't understand where this kind of distrust can end and a foundation for a marriage can begin. My marriage has not been perfect and I'm sure that my friends can point to plenty of times when they thought I should have stood up to my husband. I remember when Stephanie came to visit me after I had surgery on my ACL. I had a cooling machine wrapped around my knee as I lay in bed. My husband let her in and directed her upstairs, calling me "the princess." She was so pissed at him. As if I'd chosen to stay in bed rather than being forced to rest after my surgery. There have been other times. My friends are the ones I turn to when I'm angry. I spout the vitriole and hopefully move on, but they may feel they need to protect me from my husband. I know that's how I feel about some of my friends right now. Being judgmental isn't helpful. But, wanting my friends to be happy and to be treated well is a genuine emotion. Somehow, I need to find a happy medium. Have you ever set the bar? Decided, if this happens, that's it, I won't put up with any more? That's me, sighing because I just finished recording the grades for my five-week courses. Suddenly the summer unfolds in front of me like a morning glory just after dawn. The summer weeks were crazy with teaching and grading and preparing for classes. I hunched in front of my computer, my legs falling asleep because my feet don't reach the floor, as I prepared for teaching the three-hour class twice a week and the two-hour class three times a week. I struggled to stay on top of the grading, throwing an occasional bone to my online class which runs all summer. But now, I'm done! I'm looking forward to seeing the sun on my run tomorrow morning rather than running in the pre-dawn dark. So, I'm happy that I can spend the dog days of August writing and reading good books, but I regret the things I missed this year. As I sat on the front porch, I could hear the sounds from the municipal pool down the hill. I spotted the last hollyhock bloom of the summer, well, at least my hollyhock bloom. It waved slowly in the breeze, a pale pink circle on the tiptop of the stem. Maybe next year, I'll take the time to admire the hollyhocks all summer long and remember that working and running in moderation make a more fulfilling life. The cell phone rang at 5:24 a.m. -- its Blue October song bursting forth in the still-dark morning. I was awake but lying in bed. I rolled from the bed, grasped the phone and walked out the bedroom door. The number wasn't one I knew, but the area code was the same as my best friend's. "Hello," I said quietly, looking for a place where I could talk without waking people. I passed the bedroom door where the two teenage girls slept. In the living room, my 13-year-old was spread out on the couch. I walked out the back door and sat on the red rocking chair, watching the vines of the morning glories intertwine. "Were you sleeping?" my best friend asked. "I was awake," I continued the pleasantries. Then she burst out. I felt my stomach drop and soar as if on a series of roller coaster hills. He, the odious husband who made most days a misery, had left her? It seemed like a dream come true, a perfect outcome, but she sounded upset. I contained my glee and asked for the story. After she went to bed the night before, he found her phone and went through her text messages. Apparently, she had sent a message to an old college boyfriend that said she was shopping for bras. Her husband found that inappropriate. There were others that he questioned even though the men live states away from her. He was convinced she was cheating on him. He kept the phone, refusing to give it back. I guess he planned to use it as evidence of her infidelity. I tried to be supportive before I said, "This is like a gift." "But he thinks I'm cheating. He's making me feel slutty." For the record, she hasn't cheated on him. I'm not sure why. He's the most self-centered person I've ever met. When she was pregnant with their son and her father was dying of cancer, he scheduled eye-corrective surgery and demanded a ride. Then he told her she was ruining this very special day for him. He takes no responsibility for anything. The other night he sat watching baseball with his now-five-year-old son beside him then yelled at my bestfriend that the boy didn't get a bath. My best friend has children from a previous marriage. The very savvy teenage daughter asked her mom, "If I learn to make martinis, will you divorce him?" I love that girl. If I knew this man as a person, I wouldn't hate him. He's just a man who can be polite for a little while but he can't keep up the charade for long. He wants things done his way, but he isn't willing to actually do anything about it but complain. The reason I hate him is that he makes my best friend miserable. She rushes to clean the kitchen or insists the kids rake the lawn on the one day they are with her to appease him. And guess what? It doesn't make him happy. Nothing can make him happy. This morning he demanded she print off all of her emails since January. When I talked to her this morning, she said she was going to do it, to prove nothing was going on. But she warned him that could be the end of their marriage. "Why isn't the question be the end of the marriage?" I asked. If someone demanded that of me, I'd say, "Screw you. I don't have to prove anything." By this afternoon, she was pissed. Pissed that he'd made so many demands, pissed that he'd held her phone hostage, pissed that he threatened to tell the children he was sleeping on the couch because Mommy cheated on him. She went to talk with her 11-year-old and said, "He's really angry right not and you should try to just stay away from him." "That's okay," the blond, curly-headed boy said. "He's pretty mean anyway." That made me so sad. How can you stay with someone who is mean to your kids? I've pondered the whole cheating thing. Why is he intent on this? My best friend doesn't have a spare minute to herself, much less to cheat. Her husband's first wife cheated, or he says she did, so maybe that's why he's obsessed with it. This afternoon, I decided he wants to think she cheated. He's as unhappy as she is. He wants out of the marriage, but it can't be his fault. He has to find a way to blame someone else. Cheating seems like the easiest solution. Let him think that she cheated, as long as he leaves and she can find some peace. Of course, if she stays with him to work on the marriage, I will still be there for her, hoping he'll turn into someone who can love and nurture her the way she deserves. Ok, so I made a valiant effort on Saturday to effect change in my life.....I made an appointment to cut my hair. Me: sitting in the stylist's chair under the most unflattering overhead light I have ever experienced, and thinking, "I am going bald" and "Why did I wait so long to do this?" Bleach blond stylist, about 16 years old: "Oh, your ends are really damaged. I'm going to have to trim at least an inch, or Locks of Love won't accept it." Me: somewhat embarrassed about the condition of my hair: "Oh, ok, that's fine. I have plenty!" BBS-16 yrs: "Oh, you have grey in your hair. I'm not sure we can accept that for donation." Me: more than embarrassed, yet miffed. "You're allowed to have up to 5% grey in your hair, and I don't have that much. Plus, I have donated my hair here before." BBS-16 yrs: "I don't think you can." consults with 12-year-old bleach blond stylist next to us. BBS-12 yrs: "Oh no. We don't accept grey hair. It's donated to make wigs for children." and for added humiliation "You can't dye your hair either." Me, completely humiliated, thinking: "I am going to cry." plus "If I dyed my hair, do you THINK you'd see any grey in it, you twit!" What I actually say: "I researched the website before I made my appointment, and it said that you could donate hair with up to 5% grey in it. I do not color my hair (duh!)" Me: "Well, I have been growing my hair for almost 3 years in order to donate it, and I don't want to waste it. Do you...never mind. I'll call around and find somewhere else to donate it." Children stylists: "Ok. Sorry! Have a nice day!" Footnote from Paulita: "Adding toes" is code language for stepping across the line to get out of a bad situation. Stephanie said she had one foot out and we, her good friends, said she had only a toe across the line. She's working on getting the entire foot across that line, thus "adding toes." This Sunday morning I lay in bed until 6. Things I needed to accomplish whirred through my head before I pulled myself out of bed, fed the cats, started some laundry, made some coffee. When I send query letters to agents, I research them, find out what kinds of books they represent and try to find a specific book that may be similar to the one I want them to sell. Sometimes I click around from link to link searching, other times I go to book stores and peruse each one for the name of an agent. I sent two email queries then came to an agent who wanted a snail mail query. I printed it out, tried to write the address neatly on the front of the envelope, then went to my purse to grab the stamps. When I opened my purse, I saw a lotto ticket for last night's drawing. "Better check that," I thought. I could be a millionaire already. And then the thought ran through my head, what would I be doing if I was a millionaire. Would I still be sending out query letters? The answer was yes. Money makes no difference in trying to find an agent. I would still be writing and trying to sell my fiction. It's what I love to do. Would I be teaching at two colleges if I won the lottery? No. Although I enjoy interacting with the students, writing is my passion, not teaching. That's my reminder from the universe. Don't get caught up in the day-to-day salary earning, remember to do what you love. It's timely, that reminder, since my five-week courses are ending this week. I'm going to feel like I'm on a vacation teaching only an online course and another four-hour course at my new university employer. I need to use that time for the thing I love doing -- writing. I need to focus on my goal to write and sell fiction as my primary salary. I should resist being distracted by the opportunities to make a little extra money teaching when what I want to do is write. What things in your life would you give up if money wasn't an issue?